Think Yourself Happy – begin to gain mastery over the type of life you want to live. Think Yourself Happy is delivered by Rebecca Sanderson – Clinical Hypnotherapist and Director of The Mindset Clinic. 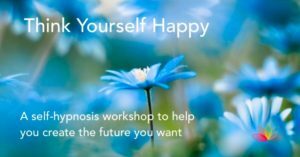 The Think Yourself Happy workshop is aimed at people who want to get more out of life and are open to learning how to use visualisation and self-hypnosis to create a compelling future. It is an experiential workshop where you can enjoy the benefits of both group and self-hypnotic trance and understand how you can transform your goal setting and attainment to a new level. It will benefit anyone with an open mind and willingness to engage with the skills taught. People who approach the workshop with a sense of curiosity can shift their perspectives, behaviours and beliefs to further their self-development. A structured and easy to follow method to take yourself into hypnosis and how to use it. Understand how the mind works and how to programme it to create the type of future you want by changing the way you think. To get the most out of the workshop you should bring with you an open mind and a sense of curiosity, plus an idea of how you would like to transform your life. Anyone wanting to enhance their lives and learn more about themselves and their potential. People who are looking for cutting edge tools to enhance and excel their personal development in any area of their life. People who are open to new ways of learning and having fun whilst doing so. The Think Yourself Happy workshop is being held at the Feel Hot Yoga Centre in Watford, Hertfordshire. Click here for map. Only £50 if you book before 20th December 2016. To book please click here or contact The Mindset Clinic via email info@themindsetclinic.co.uk for more information.